It was a day like any other. The vast infinity of the sea, the normalcy of life and average fast food. Suddenly, one of my crew mates ran into my cabin yelling, "Submarine...Captain, Submarine." I got up and asked. "Where?" I was worried that me ship will collide with a submarine but then the frantic lad clarified that he meant submarine sandwiches at a place called Quiznos. After giving him a week long duty of sweeping the decks, I set course for Quiznos. Located on a well known land of food called "Bandra Linking Road", I wondered what mysteries await me at Quiznos. Quiznos is the new champion of the ring when it comes to American Submarine sandwiches or in short Subs. I had written off Subway months ago since I was tired of cold, soggy and unloved subs offered by them. But I had not written away subs. Quiznos was the perfect answer to my cravings for Sub. Toasted, warm and made with real ingredients. Quiznos has delivered a knockout blow to the competition in terms of quality. If you want a good Sub, it has got to be at Quiznos. 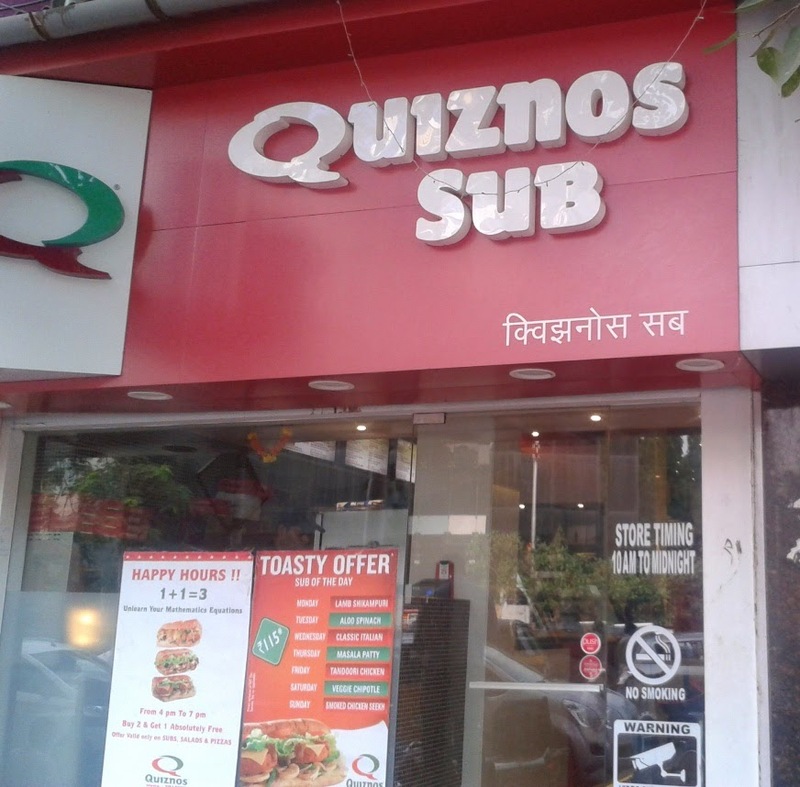 Located opposite National college on linking road, Quiznos is relatively easy to reach. It just took me a ten minute walk from the Bandra station to reach here. If you are located in Bandra or Southern Mumbai then there is always a direct bus route that connects you to a hundred meter vicinity of Quiznos. It could be a little hard to spot for first timers. But it is near the traffic signal and you would see it if you walk towards the signal. At first glance, Quiznos appears as a typical mini cafe type restaurant but in spirit it is entirely different. Once you step inside, it feels like a different world compared to the chaotic college street-traffic junction outside. You leave the chaos at the doorstep and step through a portal that transports you to a place of relative tranquility. Indeed, that is what I felt as I entered Quiznos. And this is during the day. At night the place goes gold, literally. 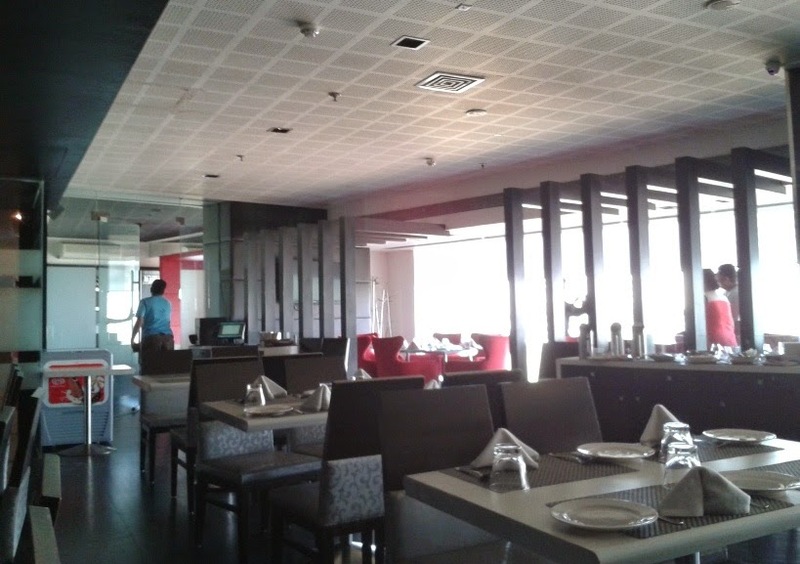 The indoor lighting work is nothing short of brilliant. I soon met one of Quiznos' Chiefs - Bhavna Khatri. Along with her husband Bhavesh Khatri and his cousin Kunal Khatri, they make up a very young trio of entrepreneurs. Their feat is commendable as they have introduced Quiznos to Mumbai. After going through the menu and discussing the subs with Bhavna, I decided to try something which I have never had as a sandwich before.A Tuna Melt Sub accompanied with Chicken Breast Salad. Crew Mate : Cap, it looks like a regular Sub to me. Whats new ? Captain : Appearances aren't everything lad. 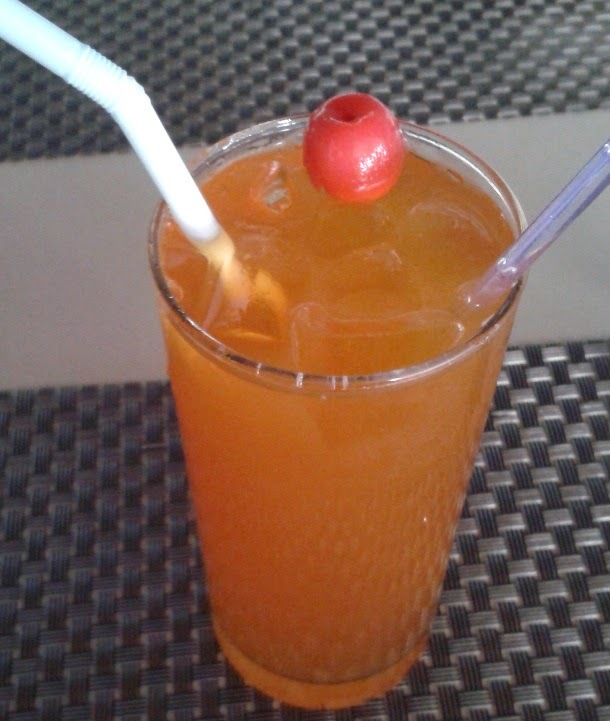 Lets have a taste. Crew Mate: So how is it Cap?... Captain ?... You could stop eating for a second and tell me. Captain : The love of the seas. The Tuna aye. So good, must eat first. Must ignore me silly pesky crew. At a cursory glance it resembles any other sub but the experience begins when you touch it, savor its aroma and then eat it. I was skeptical at the start but as soon as I took my first bite, I knew that it was top notch. 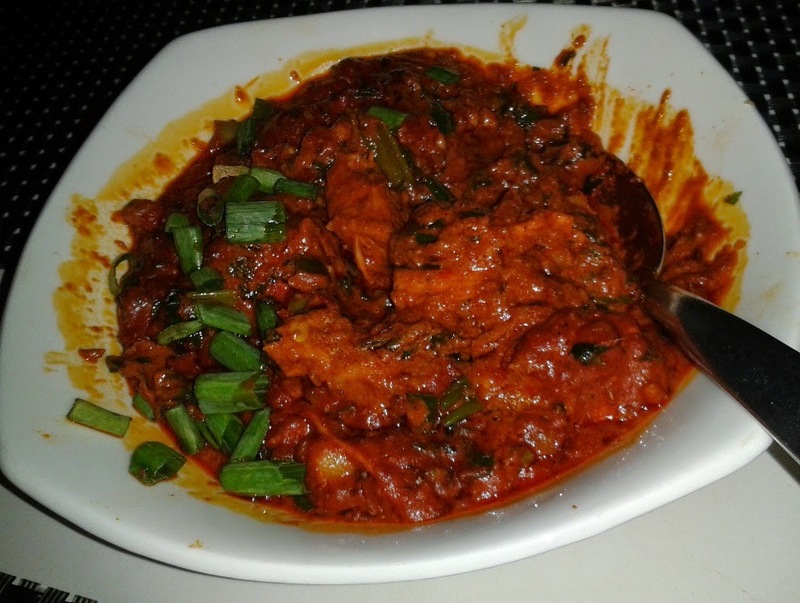 Tuna is a fish which can taste very differently in the way its prepared. Tuna in Japanese food or pizza or a Sub can taste different. The Quiznos Tuna Melt Sub was a flavorsome preparation. Unlike Subway, the sandwich was not soggy and did not disintegrate when I lifted it up. It remained in one piece and I could comfortably take bites without dropping the stuffing out of it. There was no over dose of vegetables and sauces. The flavor of the "sweet n savory" Tuna meat remained intact. 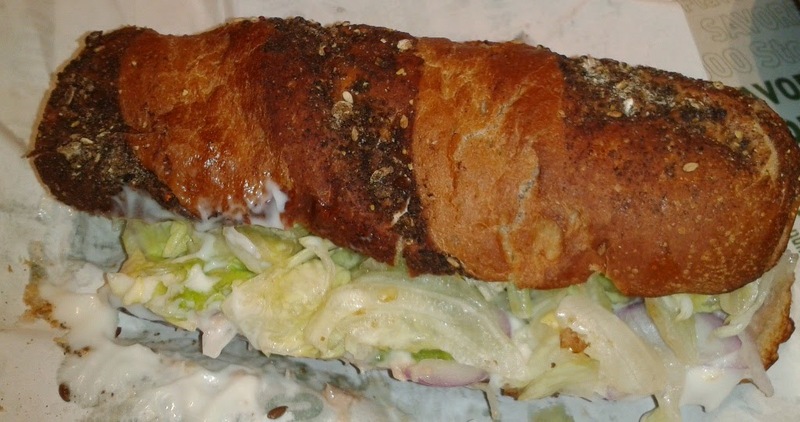 Along-with mayonnaise dressing and melt in your mouth cheese, this sub was exemplary. One oft wonders how the world would be if things evolved differently. What if ships were made using a different principle? What if Gravity was a lot more complex than we understand it as? What if Subs were toasted instead of being dumped cold on a roll of paper? Subway Subs are not warmed. They are assembled at a record speed using ingredients which are the opposite of pristine. Impressive for the assembler. Not so much for the consumer. Quiznos uses better ingredients, meats and is even a bit healthier than its competition. Everything is baked, nothing is fried. And then they add the secret ingredient. Chemical X ? No silly, they toast it *wink*. Food is made with lots of love and a little chemistry. And temperature is a pretty big aspect of that chemistry. Toasting a sub gives it a distinct flavor which definitely befriends your taste buds. And you get such Subs only at Quiznos. Captain : I dont like Greens, A man of sea cannot eat Salad ! Crewmate : But you must try Green salad and chicken. Captain : Don't you Dr. Seuss me. Despite not being a big fan of Salads, I was still tempted to try the Chicken Breast Salad. The delicate balance of the vegetables and the chicken could be tasted in every bite. The olive was the dominant ingredient in sense of flavor from the vegetarian team. And for the other team, the chicken blended perfectly with the ranch dressing. The vegetables appeared to have a good texture and quality. This was a much welcomed contrast to the lackluster greens used in salads at other fast food chains. 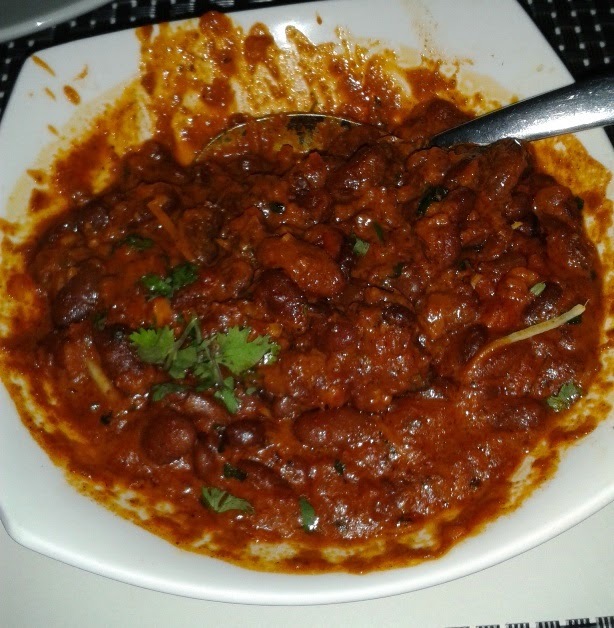 It was visibly enticing and tasted equally great. And as a bonus, it was quite healthy as well. 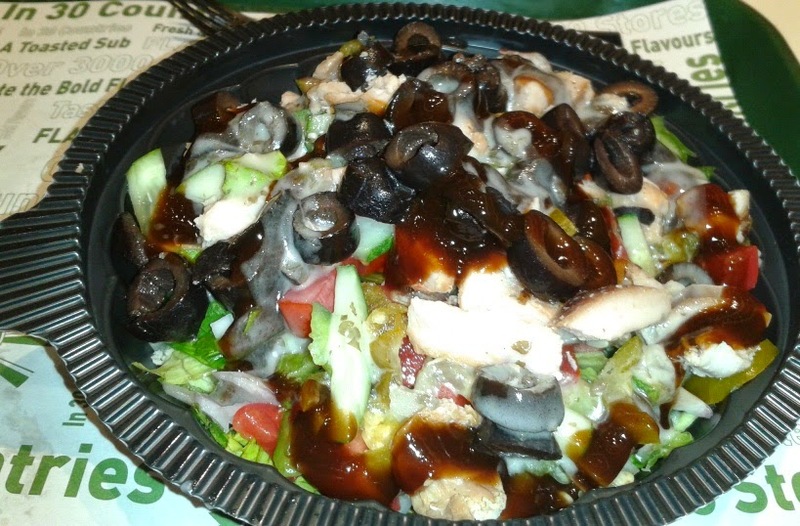 If you are on a diet but your taste buds keep you awake at night then the Quiznos Salad is definitely a viable option to your cravings. Captain : I like Green Salad and chicken in a Cafe, I like Green Salad and chicken on a ship. Thank you Sam. Crew Mate : My name is not Sam, Captain. They offer gourmet cookies as desserts. They offer pizzas too. Since I did not try the Pizzas yet, I can't comment much about them. I would just say that if they follow the same standard like they do for their subs, then these are positively good pizzas. The pricing is slightly higher than Subway. But given their greater standard of food , the difference is not even worth mentioning. Quiznos doesn't show less than believable TV ads or have excessive brand promotions. But they win at taste and that's all that matters for an eatery. 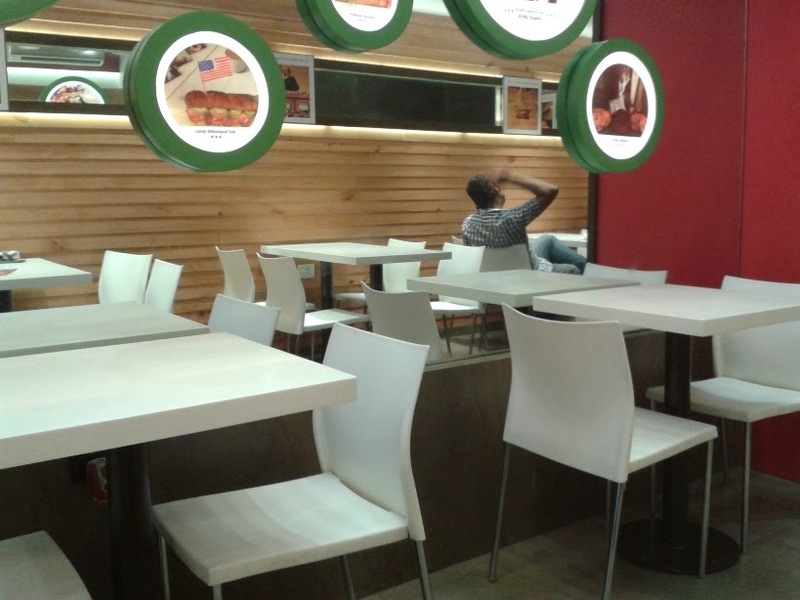 Quiznos is still a fledgling in Mumbai and it has a long distance to go. They certainly have the food for it. I would like to see Quiznos outlets in the suburbs. If there was a Quiznos outlet near my home, it would definitely be one of my regular hangouts. I would certainly choose it over McDonalds, Subways and Cafe days. Concluding, I would say that the food was definitely worth my long epicurean trek to Quiznos. I would recommend it. "Time to move ya lazy lads. The oceans are waiting. Until next time!"